The world’s demand for laminated furniture, worktops and flooring continues to grow, with increasing demand for toughened surfaces leading to greater use of an abrasive resistant paper (ARP) coated surface. Traditional pumping solutions experience high rates of abrasive seal wear and require increased maintenance, problems not experienced with a Verderflex Rollit. Typically, the abrasion resistant surface is produced by adding Corundum (Al2O3 ) to melamine resin to form a final product surface with enhanced ability to meet the anti-scratch Martindale test. The combination of a viscous melamine resin with abrasive additives such as Micro Corundum and Corundum makes this an ideal application for a peristaltic pump such as the Verderflex Rollit. A peristaltic pump operates by a very simple, well proven principle, peristalsis. The alternating compression and relaxation of a hose primes the pump and transfers the product to its delivery point. A rotating roller passes along the hose length, totally compressing the hose. 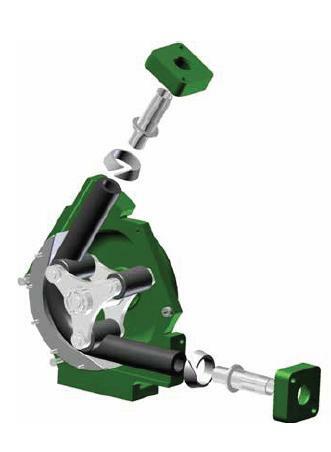 It creates a seal between the pump’s suction & discharge sides to eliminate product slip and remove the need for check valves and similar ancillary equipment, eliminating unnecessary complexity or high parts counts. Other pump technologies find this a demanding application suffering from worn diaphragms or stators, or excessive abrasive seal wear. These technologies have high shear forces that can result in bubbles in the resin adversely affecting final product quality. Additionally, these viscous products can cling to pump components increasing servicing time and costs. In contrast, the Verderflex ROLLIT is a proven performer in many laminate manufacturing plants worldwide, transferring these viscous, abrasive resins into the coating process. The hose is lubricated with a special purpose grease on installation, eliminating lubricant baths that require emptying whenever hoses are changed. Like all peristaltic pumps, the Verderflex Rollit has a very gentle pumping action, eliminating ink foaming and consequent print quality problems. The Verderflex Rollit has PTFE rollers and inserts to minimise friction and heat generation. This is combined with a low working pressure for an optimum energy efficient pumping solution. The Verderflex Rollit contains the pumped resin inside its hose removing the requirement for seals and their consequent wear and maintenance issues.